Jason B. Bozzone, president of Pope John Paul II High School, Royersford. Jason B. Bozzone has been named the new president of Pope John Paul II High School in Royersford, effective July 11. The Archdiocese of Philadelphia’s Office of Catholic Education (OCE) and the Faith in the Future Foundation (FIF) made the announcement June 24. He succeeds Louis Giuliano, who has been named assistant chief financial officer in Educational Financial Services for OCE. 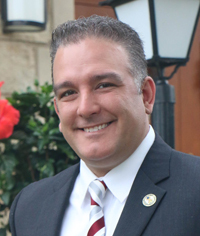 Bozzone called the appointment “a tremendous honor” and said he looked forward to “strengthening the identity of the archdiocese’s newest school” as he seeks to “engage our students, parents, alumni, faculty, staff and community partners in an effort to have a collective impact on our goals while inspiring our next generation of servant leaders. Bozzone joins Pope John Paul II after 15 years working in higher education, the last nine at Temple University where he most recently was assistant dean in the College of Education. In that role he was credited with “creating sustainable strategic vision, mission, staffing and programming for a diverse student body and alumni,” according to a statement by the Philadelphia Archdiocese. He was also responsible for leading a $1 million capital campaign and he developed new enrollment management practices and retention strategies. Prior to Temple University Bozzone worked in advancement, alumni relations and student life at the University of Pennsylvania, Cabrini College and Pennsylvania State University’s Abington Campus. He is a graduate of Pocono Mountain High School, received his Bachelor of Science degree in secondary education/social studies with an emphasis on political science from Kutztown University and earned a Master of Arts degree in college student personnel from Bowling Green State University. Bozzone was born in the Bronx, New York and raised in the Pocono Mountains of Pennsylvania. His wife Melissa DiNofia-Bozzone currently works at the Baldwin School in Bryn Mawr as director of advancement and engagement. They have three children (Peter, age 9, Sophia, age 7 and Madeline, age 5) who attend St. Andrew the Apostle School in Drexel Hill. Members of St. Andrew Parish, the couple serve as co-chairs of the parish’s capital campaign. Bozzone is a long-time baseball coach for youth teams in the Drexel Hill and Llanerch areas. He and wife Melissa actively support awareness and fundraising efforts for children who are deaf or hard of hearing in support of their daughter Madeline. They are appointed board members on the Clarke School Leadership Council for Pennsylvania. I am so happy for Jason and his newest role! You could not have found something with more passion and integrity! Pope John Paul II high school is so blessed to have his leadership! Congratulations to Pope John Paul HS and Jason on a great pairing.